~Dreamer~: Sakae Sushi Turns 19! Sakae Sushi celebrates its 19th anniversary and they are looking forward to celebrate with you- their loyal customers! Looking back, Sakae Sushi has definitely expanded from its humble beginnings. However, one thing always remains the same- the brand's passion in serving tasty, healthy and value-for-money Japanese cuisine in a fun and friendly environment. To make the anniversary a truly meaningful one, Sakae Sushi took the opportunity to conclude the 'Joy of Giving' campaign with a cheque presentation ceremony held at Sakae Sushi, One Utama. A unique charity initiative by Sakae Sushi, 'Joy of Giving' was held in conjunction with the launch of Sakae Sushi's attractive 2016 calendar. As consumers snapped up the limited edition calendars nationwaide, Sakae Sushi in turn channelled RM1 to HOPE Worldwide Malaysia for each calendar sold. Sakae Sushi presented HOPE Worldwide Malaysia with a total amount of RM20,000 in donations which will be used to help and support causes for the underprivileged. As a global chain restaurant, Sakae Sushi undertakes several effective measures to maintain food quality standards. Some of the efforts include making frequent farm visits to ensure the safety and traceability of food sources. In addition, Sakae Sushi's food is sent for laboratory checks on a regular basis to retain the highest food safety and quality standards. All these stringent implementations go a long way in ensuring utmost quality and freshness for every dish served. Having journeyed through 19 delightful years of providing good food and improving on the way, Sakae Sushi promises to continue to cherish every valued customer by delivering good food whilst rewarding customers by offering exciting promotions. 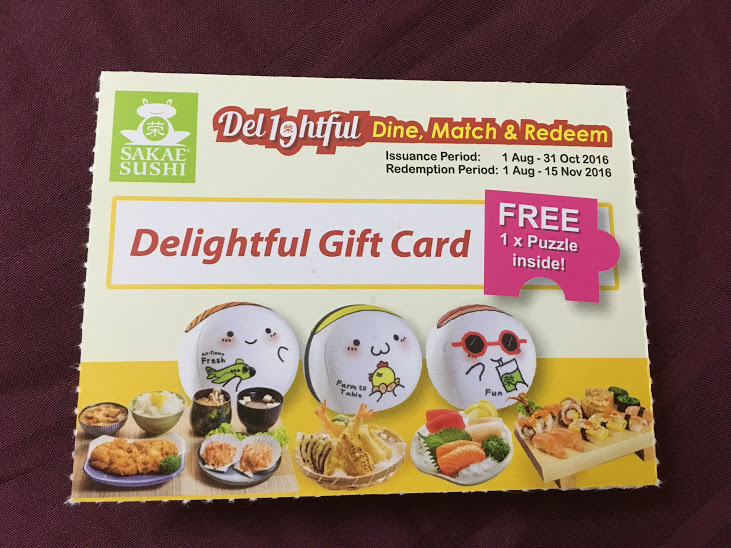 In conjunction with the campaign theme, this year Sakae Sushi brings its customers to a fun-filled and rewarding offer which is the Delightful Dine, Match & Redeem promotion. Here, customers will stand a chance to win some of Sakae's all time favourite dishes and even bring home an adorable limited edition Sakae Sushi Plushie. To participate, a customer will have to first spend a minimum of RM60 in order to get hold of a Delightful Gift Card. This is how the gift card looks like. This vibrant gift card consist of a puzzle sticker, and for every matching puzzle, the customer will be rewarded accordingly. 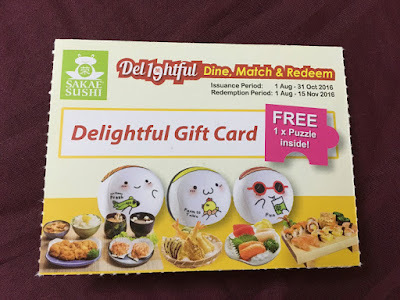 To redeem, you need 2 matching puzzles for 1 free dish, 3 matching puzzles is equivalent to 2 free dish and the grand prize which is 4 matching puzzles will earn the customer 4 free dish and 1 limited edition Sakae Sushi Plushie. For instance, 2 matching puzzles will either get me a free Sashimi Mori Aki for matching box 'B' and 'D'. A free Fuku Set, for matching box 'C' and 'D'. The Plushie is available in 3 designs- Salmon Sushi, Tamago Sushi and Ebi Sushi. This exclusive range was made specially in conjunction with the anniversary celebration. Each design is in fact representative of unique aspects of Sakae Sushi- for instance, the Salmon Suhsi Plushie which carries a mini plane reminding customers that all salmon at Sakae Sushi is air flown fresh from the Atlantic. Meanwhile, the Tamago Sushi Plushie carrying the chicken and eggs ith its hands indicates Sakae Suhsi's farm-to-table philosophy and last but not least, the fun looking Ebi Sushi Plushie which spells a fun-filled dining experience for patrons at all times. At the back of each Plushie is a wonderful message that expresses the dream of Sakae Sushi's founder- 'Think Sushi, Think Sakae'. As the words go, the ultimate dream is to bring Sakae Sushi to a global realm, where it will be accessible to all who crave for tasty, quality and value for money Japanese cuisine. In order to bring home of these Plushie, one can either participate in the Delightful Dine, Match & Redeem promotion or enter Sakae's facebook contest. Alternatively, the Plushie cans be purchased at an affordable price of RM29.90 at any Sakae Sushi outlets. Without a doubt, this marks yet another remarkable milestone for Sakae Sushi! Rest assured, this well-loved Japanese restaurant will continue to strive tirelessly to serve its customers with quality Japanese cuisine.